CEDAR CITY — Supporters of Utah’s “Count My Vote” initiative held a series of public hearings around the state last weekend, paving the way for the group to start collecting signatures to get the measure put on Utah’s 2018 general election ballot. According to proponents, the non-partisan initiative is designed to improve voter participation in elections and enhance candidates’ ability to get their names on the ballot. The measure calls for a direct primary election to become the only mechanism through which Utah political-party nominees are selected for inclusion on the ballot for public office, at the federal, state and county levels. The initiative also reduces the amount of signatures required for a political party’s candidate to get his or her name on the ballot for a direct primary election. The proposal calls for a 1 percent threshold for all registered party candidates. This would mean, for example, a Republican candidate for statewide office would need 6,514 signatures and a Democrat would need 1,595 to get their names on the ballot. Third-party candidates would need even fewer signatures. Currently, candidates of any registered party must obtain 28,000 signatures to appear on a statewide ballot, as required by SB54, a three-year-old compromise law that enables candidates to bypass the caucus-convention system by collecting petition signatures instead. The intent of the 1 percent threshold is to limit non-serious candidates without placing too high of a barrier or financial burden on those who are serious about running, Count My Vote officials said during an Oct. 28 meeting in Cedar City. According to the proposal, each party’s primary candidate with the most votes would advance to the general election, as long as the top vote-getter receives at least 35 percent of the ballots cast. If no candidate receives 35 percent or more votes, a by-mail runoff election would be conducted between the top two vote-getters to determine which of them will appear on the party’s general election ballot. Count My Vote officials made a whirlwind tour across the state last weekend. 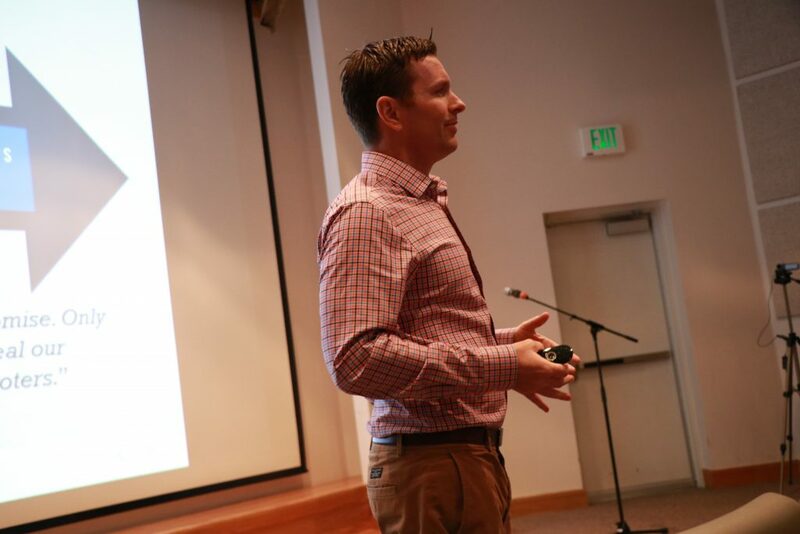 The group started Oct. 27 in Logan, held an afternoon hearing in Cottonwood Heights area of Salt Lake County and finished with an evening hearing in Ephraim. On Oct. 28, they visited Vernal, Price and Cedar City. A seventh and final hearing was held Oct. 30 in Orem. Attendance at the various hearings ranged from fewer than a dozen people to around 30, organizers said. 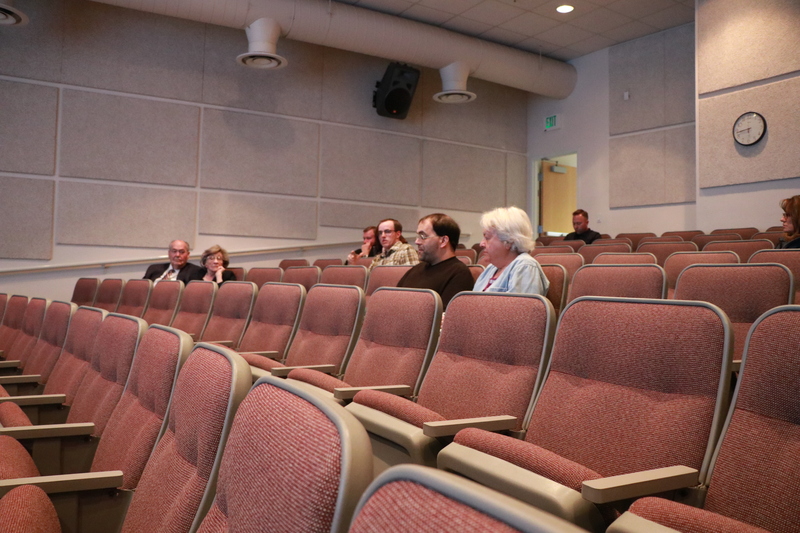 Besides the presenters, a total of nine people were in attendance at the Cedar City meeting Saturday night on the Southern Utah University campus, including a St. George News / Cedar City News reporter. “What we see is, a small number of delegates can determine entire elections in some cases,” said Mike S. Leavitt, an Iron County resident who assisted in making the presentation in Cedar City. Leavitt’s father, former Utah Gov. Michael O. Leavitt, is one of the principal sponsors of the Count My Vote petition application, which was filed Sept. 27 with the Utah lieutenant governor’s office. 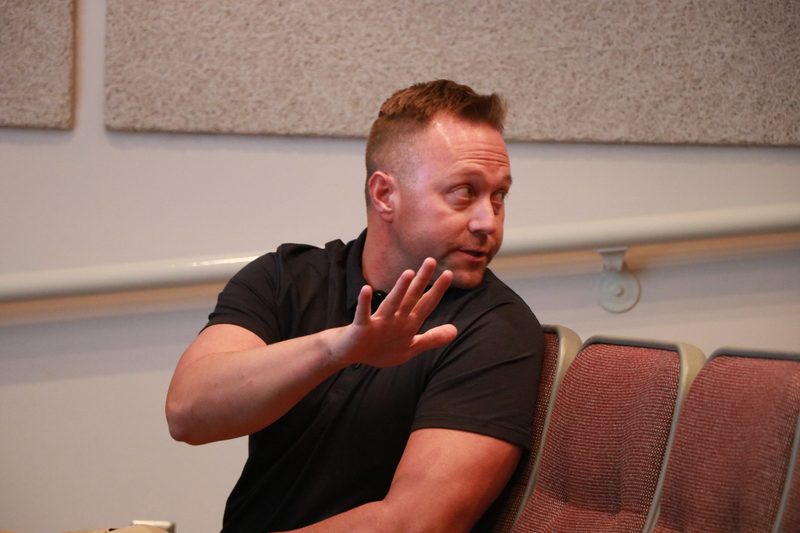 Leavitt was joined by fellow Iron County resident Mike Chidester in going over the details of the proposal using a 20-minute slideshow presentation, which was followed by another 20 minutes or so of questions and comments from audience members. Among those in attendance was former state senator Dixie Leavitt, father of the former governor and grandfather of Mike S. Leavitt. Dixie Leavitt talked about some of the pitfalls of the caucus-convention system, giving examples of where seemingly viable and deserving candidates were excluded from the ballot as a result. One recent noteworthy example involved Provo Mayor John Curtis, who initially placed fifth out of 11 candidates in the Republican convention held to nominate a replacement for former U.S. Rep. Jason Chaffetz (R-Utah), who vacated his 3rd Congressional District seat earlier this year. Chris Herrod won the GOP convention on the fifth round of delegate voting, but Curtis ended up beating Herrod in the primary election in August, taking 43.3 percent of the vote to Herrod’s 32.6 pecent. A third Republican candidate in that race, Tanner Ainge, didn’t even participate in the GOP convention, yet ended up taking third in the primary with 24.1 percent of the vote. Ainge, like Curtis, had accumulated enough signatures (7,000) to appear on the ballot alongside Herrod. 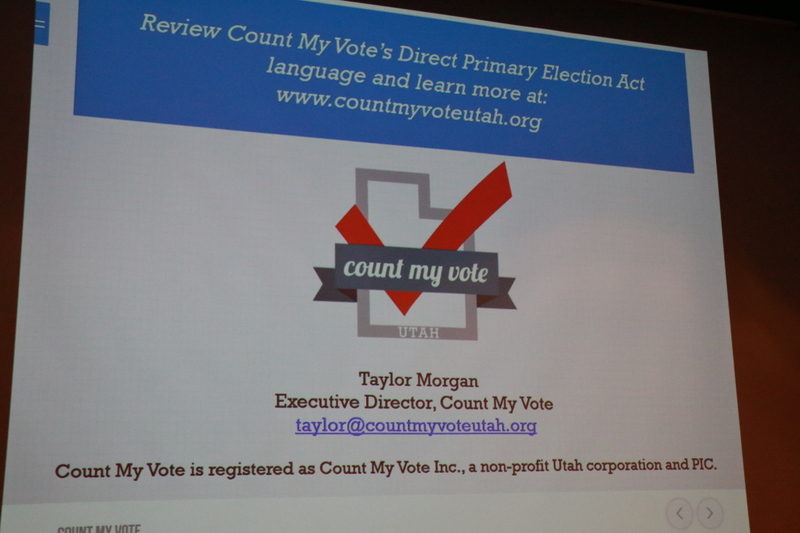 Taylor Morgan, executive director for Count My Vote Utah, said now that the public hearing requirement has been fulfilled, the group expects to be able to start gathering signatures within the next week or so, pending approval from Lt. Gov. Spencer Cox’s office. Interested voters and volunteers are asked to check the organization’s website and sign up for its e-mail newsletter that will have further details about circulating petitions. According to Morgan, a total of 113,000 signatures are required, in 26 of Utah’s 29 counties, before April 15 in order for the initiative to appear on the November 2018 general election ballot. Any registered voter may sign the petition, regardless of party affiliation, Morgan added. “We’ve debated it for years. Let’s put it before the voters and let the voters decide,” Morgan said, adding that he is confident the measure will appear on next year’s ballot. “We feel good about it,” Morgan said of Count My Vote’s ability to obtain the necessary number of signatures. The group had collected 105,000 signatures during Count My Vote’s first campaign in 2013, but ended up dropping that petition in favor of SB54, a compromise bill that allowed the caucus-convention system to stay intact while also allowing candidates to gather signatures as a way of getting on the primary ballot. Despite legal challenges mounted by Republican leaders, the compromise ultimately went into effect in 2014. This time around, Morgan said Count My Vote hopes to open up the electoral process once and for all, for party candidates and voters alike. Morgan also noted that the current iteration, which he dubbed “Count My Vote 2.0,” does not actually eliminate or prohibit the caucus-convention system. Additionally, Morgan noted that each political party will still be able to designate whether its primary elections are open or closed. Currently, for example, the Republican party holds closed primaries in Utah, meaning only registered GOP members may vote in the party’s primary election. In contrast, the primary elections for Democratic party candidates have traditionally been open to unaffiliated voters or others not belonging to the Republican party. The Count My Vote initiative is not without opposition, as a number of Republican leaders have said it undermines the party’s ability to select its own candidates. Guymon said the initiative is likely to hinder rather than help candidates who lack money and name recognition. The proposed Count My Vote initiative has an estimated financial impact of up to $3.35 million every two years, as calculated by the Governor’s Office of Management and Budget. However, Morgan said that total includes the roughly $2.9 million it would cost for an extra runoff election in every county of the state, if such a scenario were to happen. Count My Vote Utah’s website. Presentation given at Count My Vote’s public hearings. Official copy of initiative petition application.